Seabrook Island A maritime forest located 23 miles south of historic downtown Charleston, SC, Seabrook is a private island community along the western tip of Kiawah Island. The coastal barrier island is alive with native wildlife, scenic marshes and several of the widest beaches in the Lowcountry. 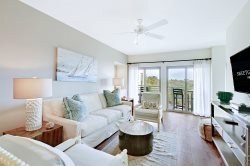 And along with its natural splendor, Seabrook plays host to two championship golf courses, a world class tennis center, horseback riding, a spectacular new beach club and so much more. Isle of Palms Located 11 miles north of historic downtown Charleston, SC, Isle of Palms enjoys 7 miles of unspoiled beach. A gentle surf and friendly atmosphere make it a popular family destination. And with an eclectic collection of shops, seafood restaurants and surf shops, this little town is big on charm. Along the island’s northeast tip, you’ll find Wild Dunes Resort. Billed as “Charleston’s Island Resort,” the resort is a wonderland of accommodations, two Tom Fazio-designed golf courses and one of the country’s top tennis programs. It’s easy to see why Wild Dunes is such an easy choice for families that want to relax, play and be together. Sullivan's Island The classic island town. Located between Isle of Palms and Charleston Harbor, Sullivan's Island is as laid back as they come. Don’t be surprised if you see more people driving golf carts than cars. It’s that kind of island. Wide beaches and cooling ocean breezes coming off the harbor only add to the island’s relaxed vibe. Cozy beach cottages mingle with luxury estates, while a gathering of pubs, shops and restaurants create a small downtown area. Home to legendary Fort Moultrie—the site of the first decisive victory in the American Revolution. Now designated a National Monument and part of the National Park System, the fort has played a key role in protecting Charleston Harbor. Mount Pleasant Just minutes from downtown Charleston, Mount Pleasant has for years been in The Holy City’s shadow. Only recently has this town east of the Cooper River come into its own. Today, Mount Pleasant is known for the very best of the Lowcountry—amazing food, stunning waterfronts, quick beach access and historic homes. And with high-ranking schools and an established park system, most residents consider Mount Pleasant THE place. Downtown Charleston Bathed in centuries of American history, Charleston is a city unlike any other. The clip-clop of a horse drawn carriage parades visitors down narrow streets and past large antebellum homes. Known as The Holy City, Charleston spires rise towards the heavens like sacred landmarks. Today, this grand dame leaves visitors breathless. Restored homes stand as stately as they did 150 years ago. A resurgence for all things southern continues to breathe new life into Charleston. Couple that history with a award-winning restaurants, upscale bars and legendary shopping scene, and you have the makings of one of America’s favorite cities. Even readers of Conde Naste magazine ranked Charleston the #1 travel destination in the U.S.